When my Steam Extreme 3000 arrived I was tentative……would this be just another product that I used once and then it gathers dust in my garage? If I had to describe the Steam Extreme 3000 in only word….it would be INCREDIBLE! I have never loved an inanimate object before the Steam Extreme 3000. This machine is destined to be the most used cleaning product in my home ever. The Steam Extreme 3000 cleans using steam vapor and this revolutionary cleaning technique “cleans and sanitizes most surfaces killing dust mites, viruses, mold and fungi.” I am going to be honest…I am a germaphobe and make no secret about it. During cold and flu season my anxiety runs rampant. My four year old daughter is a severe asthmatic and any type of cold virus is life threatening. The ability to sterilize my home with the Steam Extreme 3000 is life changing for me because it allows me the peace of mind that I am sterilizing the viruses and molds that can trigger my daughter’s asthma attacks. How did it work? My husband and I decided to try it out by cleaning our kitchen floor. The Steam Extreme 3000 has a floor cleaning attachment and a mop cloth kit. My husband is old school and uses an old fashioned (and disgusting) mop and bucket method to clean the floor. He took one look at the Steam Extreme 3000 and snickered that it wouldn’t work as well as his mop and bucket. We have three children and a dog so our tile floors really take a beating. There were several dried on spots on the tile that were obliterated within seconds by the Steam Extreme 3000. I saw my husband getting a bit more interested and suddenly he volunteered to take over cleaning the floor. The floor was spotless in twenty minutes and my husband was speechless. We both started looking around the house for things that needed cleaning. We decided to clean our kitchen cabinets next and we couldn’t believe the goo and gunk that was coming off of the cabinets that had previously looked clean. Before we knew it the entire house including the kitchen and bathrooms were cleaned and sanitized. It didn’t even feel like work. It just felt great to know that our house was cleaner than it had been in…. well….ever! The Steam Extreme 3000 gets extremely hot (293 degrees Fahrenheit) and has a lot of pressure which really gives it the cleaning edge. Dirt and grime that is stuck on just melts off and wipes away. We used the Steam Extreme 3000 to clean our kitchen and bathroom floors, counter tops, cabinets, high chairs and dining room table and chairs, stove top, kitchen and bathroom sinks, bathtub and shower and even the windows and sliding glass doors. Kitchen: Remove grime and grease from stove tops, oven hoods, ovens and oven racks. Microwaves, refrigerators- inside and out. Clean floors, kitchen sinks and drains…plus so much more! Bathrooms: Disinfect toilets, sinks, tubs, showers, and floors. Makes mirrors sparkle! Bedrooms: Kill dust mites in bedding, upholstery, carpets, and clothing. Disinfect cribs and children’s toys. Clean jewelry. Windows and blinds: Makes glass shine and eliminates any mold or dirt build up. Sliding glass doors, mirrors, French doors – you’ll be amazed at how clean they become! Pet areas: Disinfect liter box and remove pet odors. Animal cages and fish tanks. Very effective on bird cage cleaning. Deep cleaning and sanitation. Garage/Storage Unit: Bikes, golf clubs, Bar-B-Q grills, outdoor furniture, exercise equipment, stained pots, remove spots from cement. Recreational Vehicles: Detail boats, RV’s, 4-wheelers, etc. Occupations: Perfect for professional cleaning businesses, hospitals, veterinarians, retirement care facilities or other elderly care, daycare businesses, restaurant owners or other food businesses, and many more. The Steam Extreme 3000 does not require any chemicals to clean and uses the heat and pressure of the water instead which eliminates the need for chemicals and other cleaning products which could trigger allergies or asthma attacks in my daughter. I also appreciated that the Steam Extreme 3000 has a trigger lock and safety valve that is very simple to use and protects my children from the chance of burning themselves inadvertently. The 15 cleaning accessories that come with the Steam Extreme 3000 are easy to change to fit the cleaning task and allow you to clean virtually anything. 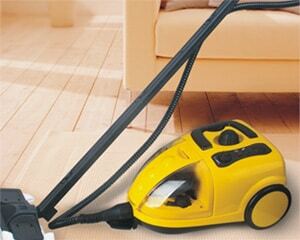 The model itself is not overly bulky and is easy to maneuver around the areas that you are cleaning. After adding the water initially it only takes 10 minutes for the unit to heat up and then you are ready to clean. You can even adjust the pressure depending on the job. My only problem that I have found with the Steam Extreme 3000 is that I have used it so much that I have run out of things in the house to clean. My husband laughs now because I am eying everything in the house to see if it “needs” to be cleaned. Oh and my husband’s mop and bucket? It’s in the recycling bin……. To learn more or to purchase the Steam Extreme 3000 visit their site. The Steam Extreme 3000 including accessories is only $249 and includes FREE SHIPPING. When I calculated how much I would be saving on cleaning products over a one year time frame it is a real bargain. Plus, I have the added piece of mind that this is actually obliterating viruses, mold and dust mites which is priceless. Exclusive for Simply Stacie readers you can use coupon code SIMPLYSTACIE to receive $20 off the Steam Extreme 3000 or the Steam Storm Elite. I learned that SteamXtreme Cleans at 293° F (hotter than most cleaners) so it kills bacteria and disinfects germs! Visited your Open Sky Store and like the Nutra-Lift® Lash Reneu. Cleans at 293° F (hotter than most cleaners) — kills bacteria and disinfects germs. I learned it heats in 10 minutes.